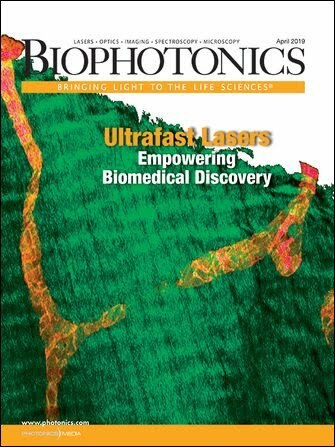 Scientists have unanswered questions about the physical mechanisms that occur when laser energy cuts living tissue. That has not kept lasers out of surgery, but now research at Vanderbilt University in Nashville, Tenn., is shedding light on the dynamics of laser-generated plasma in fruit fly tissue. M. Shane Hutson, the project’s lead researcher, said the work has led him to a greater appreciation of the role that a variety of molecules in tissue may play in the process. “The overwhelming majority of previous research focused on simpler model systems,” he said. He explained that living systems often have many uncontrolled variables that make such fundamental research extremely difficult. He and postdoctoral fellow Xiaoyan Ma studied how a short pulse of 355-nm light creates a plasma and a subsequent shock wave in the tissue of fruit fly embryos. When a laser pulse of sufficient strength strikes the tissue, it knocks free some of the electrons from atoms in the tissue. The “quasi-free” electrons quickly rejoin their atoms, which heats up the tissue and vaporizes nearby water. The vapor rapidly expands outward as a cavitation bubble, creating a series of shock waves that can be detected. Hutson said the process is interesting for two key reasons: The cavitation bubble causes tissue damage, and the shock wave formation can be used to understand the laser energy threshold needed to create the plasma. In a series of experiments using a Continuum Q-switched Nd:YAG laser delivering nanosecond pulses at 532 or at 355 nm, Hutson and Ma determined the differences in the energy threshold for both distilled water and fruit fly embryo tissue. The results in distilled water were similar to other research. However, in tissue, the threshold for the longer-wavelength light was 38 times higher. Plasma formation takes place in two stages. At first, the laser must be strong enough to generate a few quasi-free seed electrons in the focal spot. Then, as the seed electrons absorb laser energy, they drive “a cascade of ionizations” that forms the full plasma. In water, the seed electrons come from a multiphoton ionization. In the fruit fly tissue, the seed electrons most likely come from a two-photon ionization of nicotinamide adenine dinucleotide (NADH), which requires much less energy. 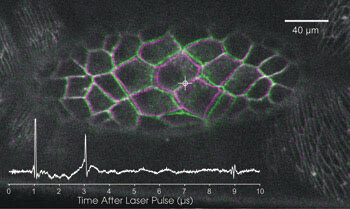 Hutson and Ma also determined that the size of the cavitation bubbles that the 355-nm laser creates is much smaller in living tissue than in pure water. Because NADH is a ubiquitous molecule central to biological metabolism, the research is applicable to a wide range of tissues, Hutson explained. In fact, NADH concentrations vary greatly between metabolically active tissue and tissue excised and stored for even a few hours. Researchers have determined that molecules such as NADH play a role in laser ablation by reducing the threshold of plasma formation and subsequent cavitation bubble expansion. They used a 355-nm Nd:YAG laser to ablate a single-cell edge in a developing fruit fly embryo. The laser was targeted to the location marked by the crosshairs. At 6 s after the laser pulse, the surrounding cells had moved just a few microns (original positions in magenta, new positions in green). The overlay shows a representative hydrophone trace, with shock waves corresponding to cavitation bubble expansion and collapse. Hutson said they intend to continue the investigation in three main areas — to explore laser microsurgery as a way to understand developing embryos; to explore how laser parameters, such as pulsewidth, affect plasma generation; and to look further into how the levels of NADH affect plasma formation. Physical Review Letters, Oct. 12, 2007, 158104.